It is raining at the Worm Farm today. A covey of Quail are pecking around just outside the office. They run from spot to spot, shaking the rain off their backs. I had wanted to write about spring planting, getting ready to sow seeds, and all things spring… Then I realized that spring rains are also part of the picture of spring. This week will be a perfect set up for next week’s sunshine. The soil will be moist, soil temperatures will be warming, and all the spring transplants at the nursery will be ready to go into the ground. As you think about planting your garden, consider adding a cup of Sonoma Valley Worm Farm’s VermiCompost to each transplant you put into the ground. Your plants will respond with better growth, more blooms per plant, more tomatoes at harvest and flavor in all your vegetables that will be superior. We have had customers come back and say they had there best garden ever, after having planted with our VermiCompost. They also reported that their vegetables and flowers stored longer, and looked better than store bought. 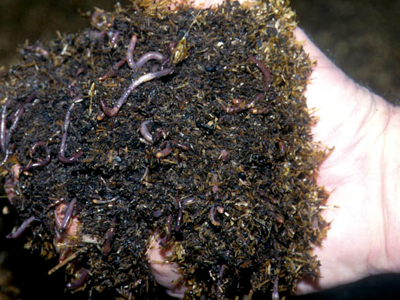 How does VermiCompost help your plants? simply put there are two powerful systems at work. The first is the ‘Worm Magic’ that worms ‘make’ as they digest their food. The ‘magic’ are plant growth hormones and plant growth regulators that help plants grow so well with VermiCompost. The other major component is a microbial inoculation of the soil where the VermiCompost is used. It amends and helps break up the soil. We had a neighbor up the street that would trade us VermiCompost for her homemade pepper jam. One day my wife and I were walking by her home, and she told us she needed some more VermiCompost for her roses. She said “I want to show you something.” She put her hand trowel into the soil and it moved down into the soil effortlessly. She then moved to a spot about a foot away and said, “This has not had any VermiCompost”. The trowel could not even get through the top crust of the adobe clay soil we have in our part of the valley. 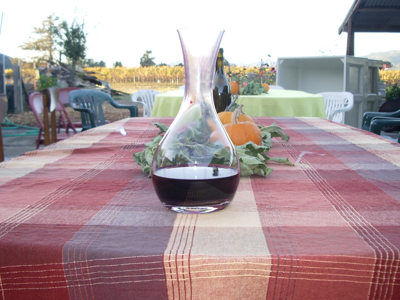 For our vineyard friends, nothing works as well as VermiCompost when planting a vineyard. In our own trial here at the Worm Farm we planted 432 vines of Syrah, back in 2002. We planted 400 vines with a cup of VermiCompost in every hole. We planted 32 vines without any VermiCompost. We lost 8 plants of the 32 we planted with no VermiCompost, for a loss rate of 25%. We lost 2 plants of the 400 we planted with the VermiCompost for a loss rate of .005%. The vines with the VermiCompost were healthier and had better growth characteristics than the plants without the VermiCompost. It costs just 12 cents a plant to use VermiCompost when planting a vineyard. Feedback from growers tell us that they can graft rootstock sooner, their vineyard has very consistent growth, and the plants all look healthy and strong. So, while the Quail scamper about in the rain, and we humans put on our raincoats one more time, it is sweet to know spring planting is just around the corner. April showers bring May flowers, and spring is in the air. Add a little ‘love’ when you plant your garden this year; VermiCompost from Sonoma Valley Worm Farm. Gotta love San Francisco. A city that has led the way so many times. In the 60’s it was all about the music. The 70’s saw the rise of silicon valley and the computer revolution. In the 80’s the San Francisco 49’ers were kings of the NFL. The 90’s saw the internet age come into being. In the past decade a slow revolution has been taking place at San Francisco’s Park and Recreation department. Instead of fighting with nature, they decided to harness the power of the natural world, and use an integrated pest management program. 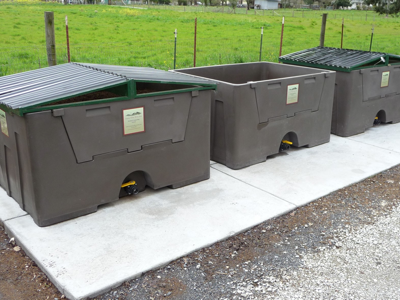 Last week they took a big step forward in closing their organic waste loop and enhancing their beautiful parks by being the first city in the United States to install a VermiComposter CF from the Sonoma Valley Worm Farm. San Francisco has joined the underground movement!! ‘The City’, as it’s called by locals, ordered their first compost tea machine in 2002 to be used at Sharp Park golf course. They wanted to enhance the natural microbiology of the turf at the golf course. Today more people know that the soil is alive and teaming with microbial life. Ten years ago the concept was new, and the idea of adding microbes and biology through compost tea was a radical new idea. The experiment at Sharp Park worked, and compost tea became more of an accepted practice at parks throughout the city. As the use of compost tea expanded, the need for chemicals started to subside. Several years ago, they started adding Vermicompost to their compost tea blend, and really started to notice an improvement in the quality of their compost tea. The next question was how to make Vermicompost from locally available inputs. San Francisco has a mounted police contingent with 16 horses. 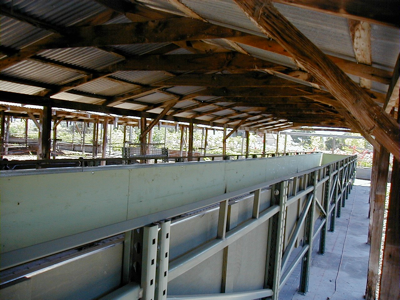 Last year they started composting the horse manure using one of our Aerated Composting Systems. They had great success composting not only the horse manure, but adding duckweed that came out of one of their ponds in Golden Gate park. 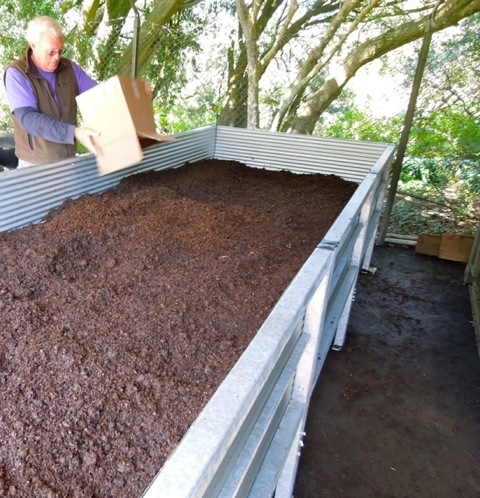 Earlier this year the decision was made to add a VermiComposter CF and let the worms complete the closing of their organic waste loop, turning their pre composted horse manure into vermicompost. This is a great story. For years now I have been advocating that every city in the country should have a worm farm and use local organics to produce vermicompost to enhance and improve the soils in their parks. So now, Chicago, New York, Boston, Denver, Seattle where are you? Come join the underground movement!! We are happy to announce the newest updated version of our VermiComposter, version 6.0! For the last twelve years I have been working hard to develop a continuous flow VermiComposter that could produce world class VermiCompost. Our latest version is at work at our Worm Farm. The big news is that we are now manufacturing this system for the folks that want to close their organic waste loop. Some of you live on a farm, and want to improve your soil tilth; orchards that want to make large quantities of VermiCompost tea; nurseries wanting to improve their plant stock; corporate campuses who wish to recycle their food waste and put that organic material back into their landscapes and gardens and finally schools and universities that can now manage their organic waste stream and keep it all on campus. Used in conjunction with our Aerated Composting System, our 40′ VermiComposter CF will produce 25 yards of high quality VermiCompost a year. A farmer could make 20 500 gallon batches of VermiCompost tea a month. 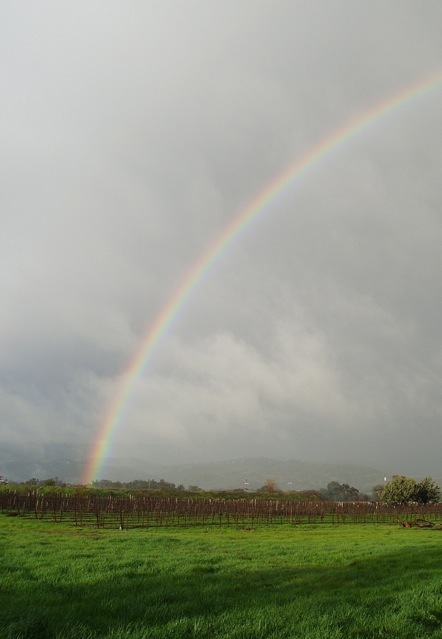 It would allow a vineyard to plant 75,000 vines. As a blend into traditional compost, it adds tremendous value with as little as 5% by volume. In my former career as an airline pilot I had the good fortune to fly many different kinds of airplanes. A few of my favorites were the DC-9, the Convair 580, Boeing 727, 757 and the Generic 747. My favorite of all was the 747-400; it seemed that Boeing had put all of its many years of thoughtful design into that airplane. You could load it with 400 people and fly for 15 hours to a faraway destination. It provided comfort for the passengers and unrivaled flying capability for the pilot. What I appreciated about good airplane design; solid engineering, beauty, ability to compete in the marketplace, strength of design, all goes into a good airplane. I feel like we have achieved these same metrics with our VermiComposter. Our Patent Pending design is made of a strong 2″ steel main frame that is galvanized throughout for a long durable life. We estimate this machine will have at least a 30 year useful lifespan. The flooring material is steel, also galvanized. The sidewalls are galvanized. Our drive system is state of the art, quiet, strong and very efficient. We have automatic limit switches at either end of the machine to ensure safe operation. You operate the system with the flick of a switch. Finally, our manual for the both our Aerated Composting System and the VermiComposter have standard operating procedures that assure you success in making the highest quality VermiCompost. My airline background taught me the importance of creating standards. Following those standard procedures ensures a good outcome in the air. Using our ‘Vermi-Protocol’ will ensure your success with your new VermiComposter. Using our VermiComposter, you can harness the power of the selfless worms and create your own high quality VermiCompost. Systems are now available for purchase. We invite you to join the Underground Movement. Thursday was a closing the loop kind of day. It started with a monsoon of rain at the Worm Farm, and ended with a fine talk by Michael Pollan. In between were composting moments, food moments and more. At the Worm Farm, I loaded up lids for the Aerated Composting System that the City of San Francisco had ordered, and that I was going to install for them at noon. The bins themselves (shown above) had arrived a couple of days earlier. I connected the fan system, the manifold and with a few turns of the screwdriver their new system was in place and ready to receive it’s first load of manure. They are going to compost horse manure from the stables in Golden Gate park. They will use the finished compost for enhancing soil structure and making compost tea. I am hoping their next step is to buy a VermiComposter CF, and make their own VermiCompost! Next it was off to Marin Academy in San Rafael. It is an incredible school with a beautiful garden and a food waste composting system that is in place. They invited me to give them a presentation on how they might improve their composting and see if worms could be part of the solution. It was great to see involved students, faculty and parents gather around and listen so attentively to a guy talk about worms! 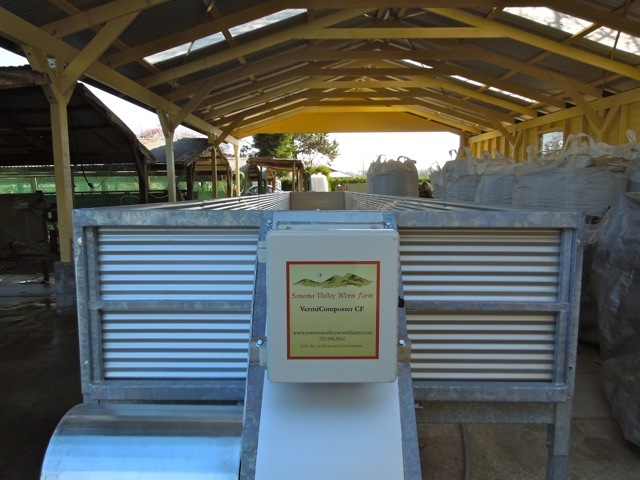 We designed our Aerated Composting System and our VermiComposter CF to help a campus, a small farm, a vineyard, or a horse farm close their organic waste loop and source the nutrients for their farm, from their farm. Our story comes full circle, by way of scoring some fine seats from the folks at Marin Academy, for a talk that Michael Pollan was giving that evening at the Marin Civic Auditorium. If you haven’t had the pleasure of hearing him speak, you should treat yourself to one of his talks if he is in your neck of the woods. He writes books, and articles about food, and what it means to us as people individually and to the country as a whole. His talk showed us how our industrialized food system, has created a food mess, an energy mess and a health crisis, all in the way we eat. Yes, our food is cheap, however we more than make up for the savings in our increased use of foreign oil, our increased obesity rates and our lack of good food choices. He advocates eating more locally grown produce. Eating more of plant based diet. Eating less meat. Growing your own food. He showed us a slide that showed a $70 investment in a garden payed back $600 worth of food. We all know that there is nothing on this earth as tasty as a home grown tomato! His talk made so much sense, and left us with a feeling of hope. Things can change. People can change. We can grow more of our own food, buy food grown closer to home. Support local businesses. Cook a meal, and then sit down and enjoy that meal with family and friends. Retooling the way we do food can help us rebuild community, both in our own homes and in our cities as well. There is a growing movement of people who want to grow good healthy nutritious food. There is a need to rebuild not only our soils, but our communities as well. We are happy to be a part of the change. It is almost here! For several years now, people have been wanting to use our technology and produce their own Vermicompost. We listened and are now almost finished with our first pre-production model. The ‘baby’ is about to be finished; hopefully this week. Our first ‘baby bin’ will be 5 feet wide and 10 feet long. It is a commercial unit with a strong drive and motor. It will bring years of service with its tried and true design. A pre-compost phase is also part of our process. We see the ‘baby’ going to farms, colleges, universities, the Google campus. Anywhere there is a desire to close the nutritional loop. Why haul away compostables when the worms can do the job for you. Use the vermicompost on site to plant trees, gardens or make your own Vermicompost tea. Close the loop we say! A couple of days later, a package came in the mail, and sure enough, a Gold Medal was there, along with tasting notes of our 2006 Estate Syrah, Lolo’s Blend. In August I had dropped of some bottles to be judged at the ‘2008 Valley of the Moon Vintage Festival, Amateur Wine Competition’. The wines were to be judged by professional wine makers. I wanted to see how our wines would be received. One judge wrote ‘This wine is awesome, a great effort’, another said the aroma and bouquet was ‘Classic Syrah’. A third said the taste, texture and flavor were ‘Complex and Velvety’. As any winemaker will tell you, ‘To make good wine, you need to start with good grapes’. The secret to our grapes – Worms, Vermicompost and Vermicompost teas. Back in 2002, when we planted our vines, a cup of Vermicompost was added to each vine at planting. 400 vines were planted this way. As a control, we planted 32 vines with no Vermicompost. Of those 32 vines, 8 died, for a mortality rate of 25%. We lost 2 vines in the other 400; a mortality rate of .005%. Vermicompost teas have been used as a drench, feeding the plants directly at the drip line. We have also used Vermicompost tea as a foliar spray to control powdery mildew and enhance our canopy. It is my belief that these vineyard practices have led to our great tasting grapes. This fruit then goes on to make award winning wines. Oh yes, the worms… They are at the core of it all. Processing our organic pre-composted dairy manure, and turning it into nature’s gold – Sonoma Valley Worm Farm Vermicompost. Give some to your vines or garden. They will love you for it! Join the Underground Movement ! The worms are slow to appear this year. They don’t exactly hibernate, but they do ‘go down’ and take a rest. It usually starts in mid-December. The weather here starts to turn cold, the warmed compost that we feed will just not warm the bed any longer. The worms dive down to the warmest part of the bed. We think of it as their Christmas holiday. The past several years they have started to become active in the later part of January. Here we are coming up on the third week in February, and they are just waking up. It seems they are not the only one’s to be still. A bee keeper told me that he had lost a hive due to cold this winter. A teacher called this morning and said her turtle was still in hibernation. The daffodils came up on schedule, but the worms and turtles still need a little time. It reminds me that we are dealing with nature, and the natural world keeps it’s own time.